Lately, I have been dishing out food cooked from either my bamboo steamer or oven. I found a sudden renewed wave of excitement in foods cooked in these two chambers. They release a certain kind of aroma that awaken my idle, sleepy palate! 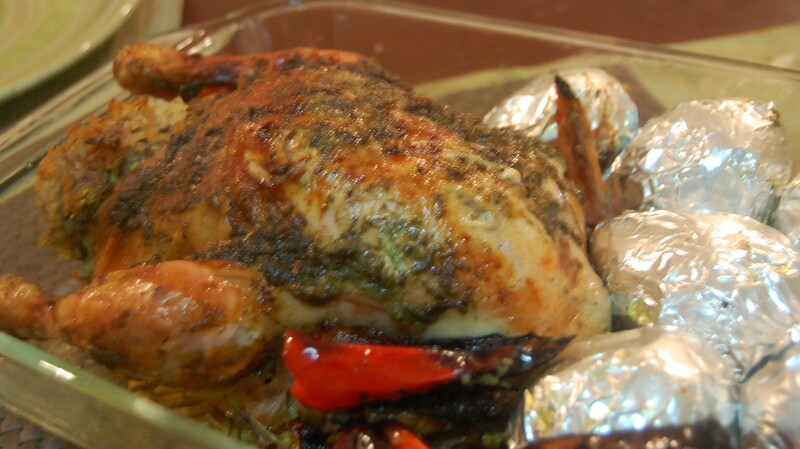 I had the time to bake chicken tonight. I decided to do a pesto based chicken rub. I always keep a jar of pesto handy in my ref so that everytime I need it, I don’t have to belabour myself in doing it. 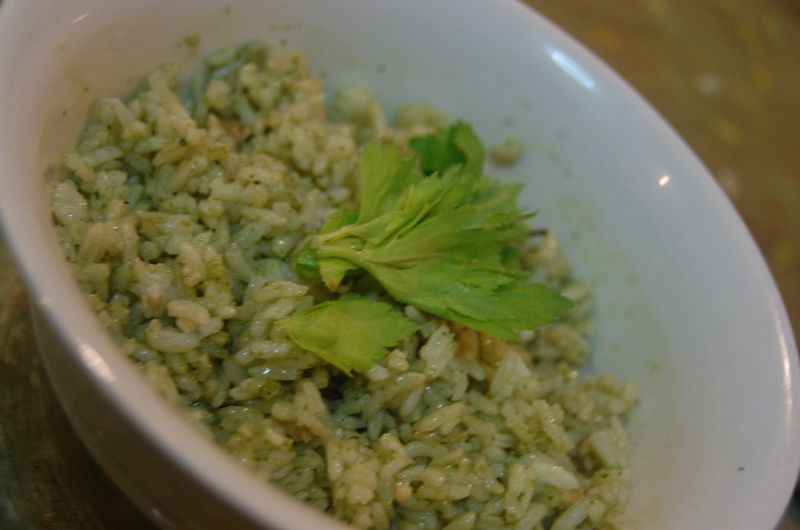 Pesto may well go with your favorite pasta, crackers, rice (pesto rice), pizza or bread. In this case, I used it as my chicken rub. Pesto may be basil, spinach or parsley based. The most common is basil. Basil pesto may be hand pounded or processed. It really depends on your preference. To make it, chop about four cups of basil. Mix in a cup of extra virgin olive oil, one and a half cups of parmesan cheese, 3 cloves of garlic, a teaspoon of pine nuts (optional), salt and pepper. Process until smooth. Consistency of this mixture well depends on your taste, really. 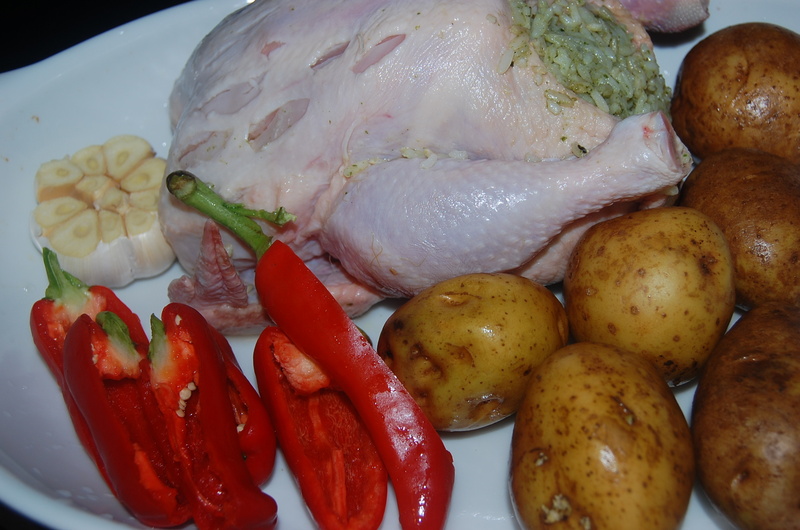 Rice stuffing is made from white rice (enough to fill the cavity of the chicken), pesto, some few slices of ginger, salt and pepper. Fuse all ingredients together to blend flavors in perfect harmony. Stuff the chicken with basil rice. You might want to mix in some shitake mushrooms into your rice or throw in some scallions for added flavor. Choose your veggie combi. I choose potatoes, red peppers and a head of garlic (upper head,chopped). Roasted garlic is best as rubs for breads like focaccia, ciabata or your regular wheat toast. You may opt to throw in eggplant, zucchini, tomatoes, white onion and other veggies you might want to have. Season all veggies with salt and pepper and baste with olive oil or butter for extra gloss. 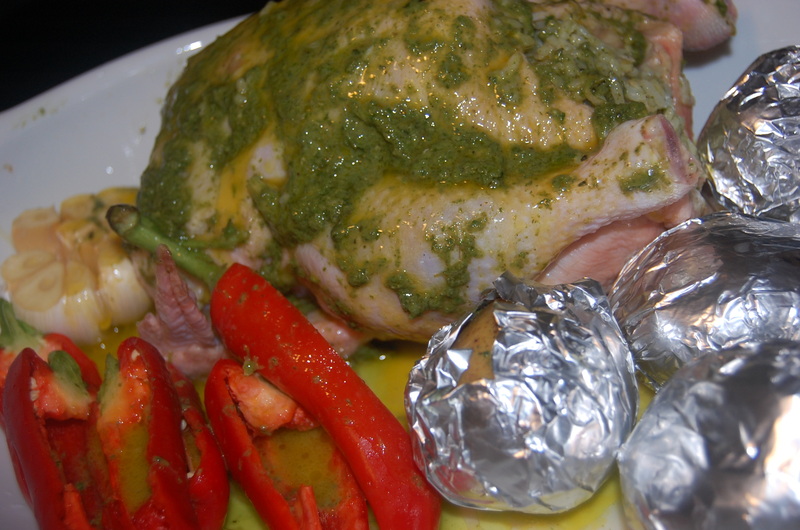 Season the chicken with salt and pepper and smother with some more pesto. Squeeze in a swig of lemon or calamansi. 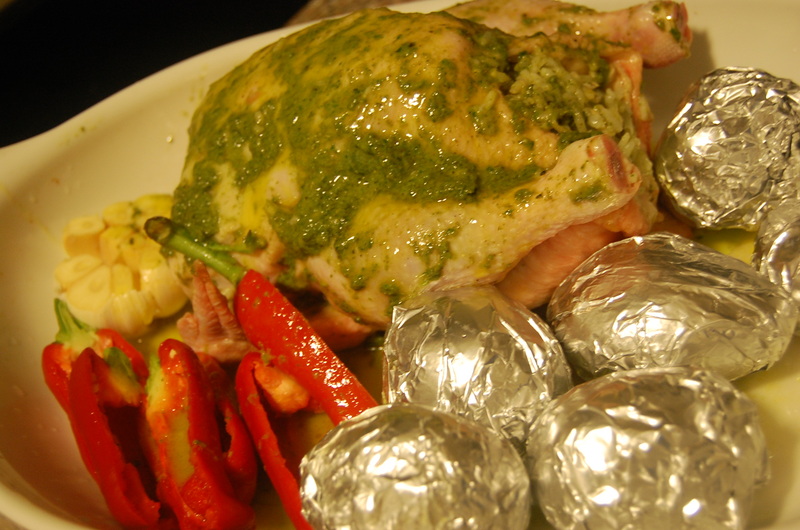 Meantime, grease potatoes with olive butter and wrap individually in foil wraps (the foil makes sure the potatoes won’t dry out). Bake with temp of 350 degrees for an hour. 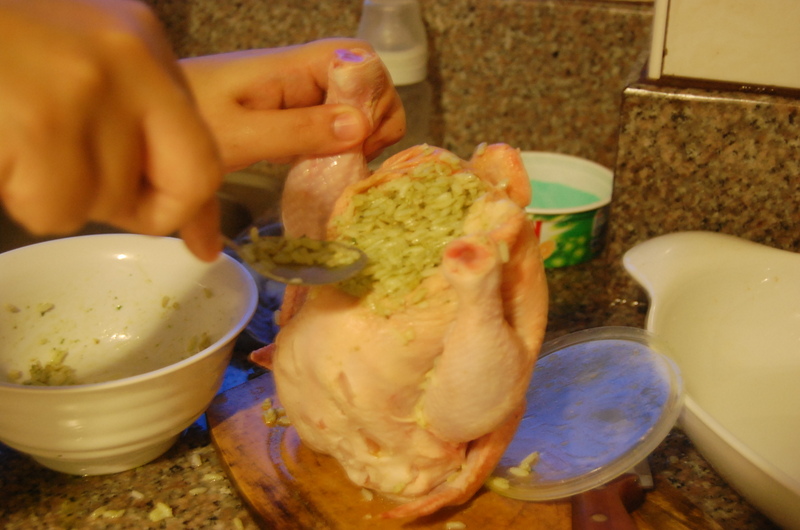 Rice stuffing has all the juicy drippings of the chicken! The ginger component in the rice stuffing is crucial. It adds extra zing to the Pesto flavor. 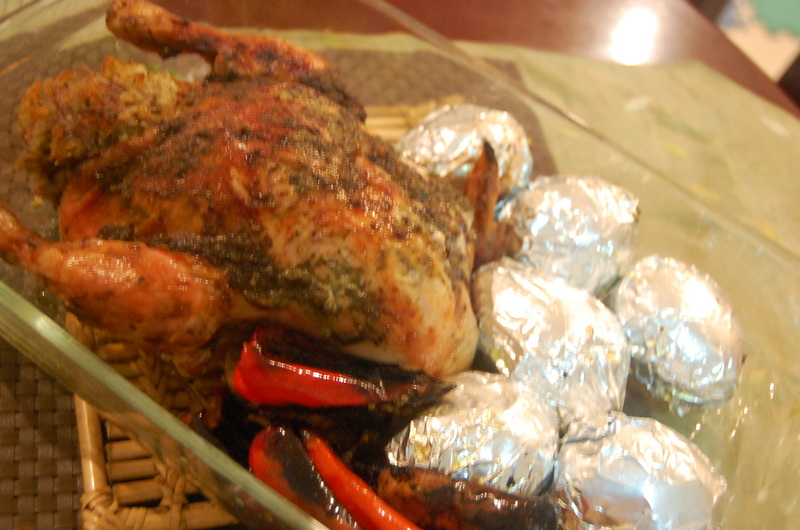 The baked potatoes that went with the chicken is best with melted cheese, sour cream or just butter on top. Sprinkle in some chives for garnish. I don’t normally give out exact measurements because everything is just based on my personal taste. Feel free to do adjustments. Let the flavors burst in your palate. Cooking is all about fun and adventure. Had this one-pot-wonder with matching Red Wine and a fantastic chat with Jake to boot.